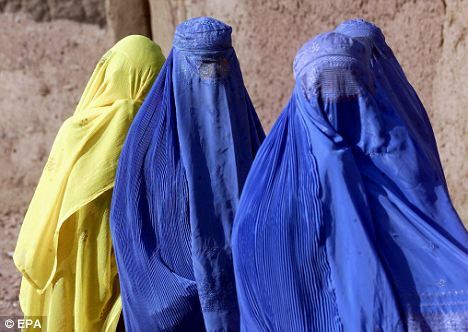 Activists have accused the Afghan president of reversing improvements in women’s rights after he endorsed a strict ‘code of conduct’ issued by clerics. 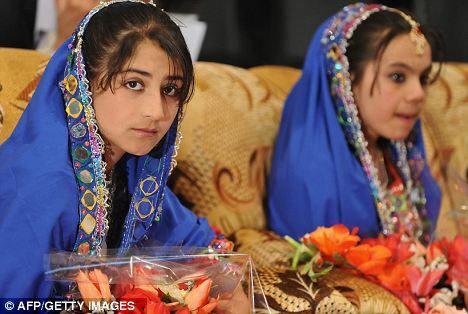 Hamid Karzai yesterday backed a document issued by the Ullema Council which promotes segregation of the sexes and allows husbands to beat wives in certain circumstances. The move is seen as part of his attempts to reach out to the Taliban in the lead up to the planned withdrawal of Nato troops from the Afghanistan in 2014. But activists are furious that gains made in women’s rights since the 2001 invasion and ensuing occupation are being used as a bargaining chip with Islamic extremists. Prior to the 2001 U.S. invasion, girls were banned from going to school and women forced to wear burkas to conceal them from head to toe. Women were also banned from venturing from their homes being escorted by a male relative. Similarly, the new ‘code of conduct’ says women should not travel without a male companion and they should not mingle with men in places like schools, markets or offices. Wife-beating is only prohibited if there is no ‘Shariah-compliant reason’, it said. ‘It is the Shariah law of all Muslims and all Afghans,’ he added. Women’s activists say the Afghan president’s endorsement of the code seems to imply that laws aimed at protecting women’s rights may be sacrificed for peace negotiations. Shukria Barikzai, a parliamentarian from the capital Kabul, who has been active in women’s issues, said she was worried that Mr Karzai and the clerics’ council appeared to be ignoring their country’s own laws. ‘When it comes to civil rights in Afghanistan, Karzai should respect the constitution,’ Ms Barikzai said. The Afghan constitution provides equal rights for men and women. The exception for certain types of beatings also appears to contradict Afghan law that prohibits spousal abuse. The guidelines also promote rules on divorce that give women few rights, a U-turn from pledges by Mr Karzai to reform Afghan family law to make divorces more equitable, Ms Barr said. ‘This represents a significant change in his message on women’s rights,’ she said. Afghan women’s rights activist Fatana Ishaq Gailani, founder of the Afghanistan Women’s Council, said she feels like women’s rights are being used as part of a political game. ‘We want the correct Islam, not the Islam of politics,’ Ms Gailani said. She said she supported negotiations with the Taliban, but that Afghanistan’s women should not be sacrificed for that end. 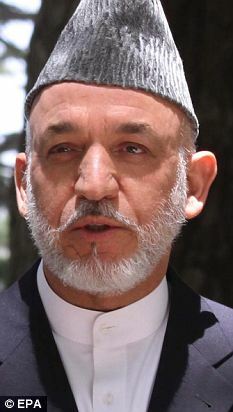 Hadi Marifat of the Afghanistan Human Rights and Democracy Organisation, which surveyed 5,000 Afghan women for a recent report on the state of women’s rights in Afghanistan, said the statements show Mr Karzai is shifting toward the strictest interpretations of Shariah law. ‘In the post-Taliban Afghanistan, the guiding principle of president Karzai regarding women’s rights has been attracting funding from the international community on one hand, balanced against the need to get the support of the Ullema Council and other traditionalists on the other,’ Ms Marifat said. The sooner we remove the Taliban from any position of power in Afghanistan the better for all Afghans , especially women . It’s just true that one cant co-exist with people who are absolutist and will not compromise on their extremist views , and who enforce their decrees by violence and murder.